The IT team at HRHCare has seen its workload rise in recent years, as the Beacon, N.Y.-based nonprofit has added facilities and expanded its services. 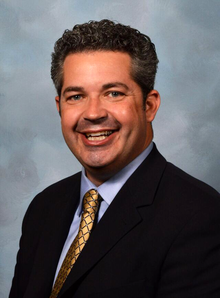 Eric Brosius, the organization's vice president of technology services, wants to expand the staff so his team will be able to cope with the added responsibilities and tackle new technology initiatives. Specifically, Brosius says he wants to add another six or seven full-time people to his staff of 17 full-timers. His first hiring priority: two tech support folks. Then he wants to hire someone with architecture skills and experience working with software-as-a-service and cloud-based offerings to guide operations as the organization moves out of its own data center into a colocation site. The results of Computerworld's Forecast 2016 survey suggest that Brosius will face stiff competition for top talent when he goes to recruit people: 37% of the 182 IT professionals who responded to the survey said they likewise plan to increase head count in the upcoming year -- that's a significant jump from last year, when only 24% said they planned to add new staff. Moreover, 24% of those polled this year listed "attracting new talent" as first among their business priorities for the next 12 months. Complicating the recruiting challenge for Brosius is the fact that he's looking for people with three of the 10 skills most in demand among survey respondents who plan to hire new employees in the next 12 months: IT architecture, tech support and cloud computing. John Reed, senior executive director of IT staffing firm Robert Half Technology, confirms that hiring managers could be facing a challenging year. "The market has been really strong, and we're expecting it will stay that way for the foreseeable future," he says. "I don't think you'll see explosive growth, but you'll see single-digit growth in demand, consistent with what we've seen over the past few years." How to cope? Companies will need a comprehensive recruiting strategy in order to bring in great workers. They'll also need to put a lot of effort into retention so they won't have their best people walking out as new hires are walking in, Reed says. "If you have that two-pronged approach, you're probably going to be OK," he says. "You're certainly going to do better than most." IT job seekers, on the other hand, are sitting pretty heading into 2016, Reed says, because salaries rise when demand for talent exceeds the supply of qualified professionals. Robert Half Technology is projecting a better than 5% increase in IT salaries for the next year. Ready to dive into the 2016 job market? Here are the 10 skills on track to be most in demand, according to IT pros who participated Computerworld's Forecast 2016 survey. * 42% of respondents with hiring plans said they will be seeking people with this skill in the next 12 months. * New to the list this year. The top 10 list starts off with a surprise. Although IT architecture is a fundamental area of expertise for techies at all levels and in various roles, it rarely makes anyone's list of hot skills. The term "IT architect" encompasses a wide range of specialists, from enterprise architects to cloud architects, so recruiters say it makes sense that IT architecture expertise is in demand as companies move forward with all sorts of technology-driven projects. Michael J. Sylvester II, CIO for the Los Angeles County Department of Public Social Services, manages about 400 staff members and another 500 or so IT contractors. He says that the mix includes a lot of people with strong IT architecture talent but adds that "we still look for people with a firm grasp of enterprise architecture. We want those folks to look at industry standards and frameworks, and to set those up so we can have uniformity." Sylvester says he wants IT architecture professionals with technical chops who have progressed from deep technical positions into more managerial roles so they can lead teams tasked with driving IT projects forward. Many organizations are seeking a similar mix -- professionals coming from sysadmin, engineering and senior engineering roles, says Tyler Mikkelson, a recruiting team lead for the Los Angeles office of Mondo, an IT recruiting firm. "They're gifted technically [and] they have strong business acumen, so they can speak to executives and C-suite individuals," he says. * 40% of respondents with hiring plans said they will be seeking people with this skill in the next 12 months. Despite fears that programming expertise is a commodity that can be obtained cheaply offshore, programming and application development continue to be among the most sought-after skills in enterprise IT. "Technology touches everything today, and programmers and developers -- they're the ones who make things go," says Jason Hayman, research manager with TEKsystems, an IT staffing, talent management and services firm. Demand for programmers and developers is springing up in new areas, too, thanks to the rise of mobile and the emergence of the Internet of Things. Hayman points to the fact that some cars now come off the assembly line with a million lines of code as just one example of how programming's footprint is widening. * 39% of respondents with hiring plans said they will be seeking people with this skill in the next 12 months. With almost half (46%) of Forecast survey respondents expecting their technology spending to increase in 2016, it's no surprise that project management remains a top five skill: More spending means more projects -- and that means more people will be needed to manage those projects. Ken Grady, CIO at IDEXX Laboratories, a pet healthcare diagnostics company headquartered in Westbrook, Maine, has about a dozen openings within his 250-member IT department, and he plans to add new positions in the upcoming year. His hiring plans include bringing on two or three project managers to join the roughly 15 project managers already working in his newly created project management office. Grady says he wants people who can help his teams work within an agile and DevOps environment, as well as professionals who can manage diverse teams and negotiate priorities, scope, deliverables and expectations with various stakeholders. "It's not a new skill, but the difference now is the way we iterate. The execution is much faster," Grady explains. "So it takes a bit more finesse in expectation management and bringing people together. I'm looking for people who have the comfort with that pace and that approach. It's as much fit as it is a particular skill set." * 36% of respondents with hiring plans said they will be seeking people with this skill in the next 12 months. The surge in interest in using data to drive business has pushed demand for big data skills from No. 10 in last year's Forecast report to No. 4 today. Moreover, in the Forecast 2016 survey, big data/analytics was No. 1 on the list of technologies that survey respondents said they were currently beta-testing or using in pilot projects, with 23% saying they were engaged in such initiatives. When it comes to big data initiatives, "companies are typically looking for someone who can help them manage data and package that data," says Reed, of Robert Half Technology. "[They want] people who can interpret and then help bring that data to life visually — building dashboards and things of that nature, so the executive suite can push through techspeak and understand what the data is telling them." * 34% of respondents with hiring plans said they will be seeking people with this skill in the next 12 months. Holding steady in the top 10 skills list is another data-related area of specialization: BI and analytics. Jeff Remis, a manager at IT staffing and recruiting firm Addison Group, says demand for IT professionals with these skills is strong, particularly in healthcare, insurance, financial services and retail -- industries where the use of BI and analytics is more mature than it is in other sectors. Remis says hiring managers are looking for recruits with technical expertise, but they also want BI specialists who understand the business and the industry. Such requirements put a premium on good candidates. * 30% of respondents with hiring plans said they will be seeking people with this skill in the next 12 months. Brosius says hiring Tier 1 and Tier 2 support people is a priority at HRHCare, where organizational growth has resulted in burgeoning technology needs. But he acknowledges that competition for talent is tough, so he says he looks for potential as much as experience when evaluating job applicants. "My recruiting model is to find prospects, people recently graduated from college. I feel they have a well-rounded education, and it gives me confidence that they can communicate and have good customer service skills," he says. "We can educate them on the tech skills, but you can't teach personality." * 25% of respondents with hiring plans said they will be seeking people with this skill in the next 12 months. Demand for database administrators remains high thanks to the ever-increasing interest in big data, BI and analytics. In its 2016 Salary Guide, Robert Half Technology lists database administrator as one of the most in-demand specialties, noting that "more companies are using big data analytics to help inform business decisions and are relying on specialized personnel for managing and interpreting raw data." The guide also states that salaries for database administration positions will rise by 4% to 9% next year, with pay ranging from about $100,000 to $200,000. Recruiters say employers want people with extensive backgrounds in database administration and a deep understanding of data reporting tools and technologies such as Oracle, SQL, DB2 and Hadoop. Although security expertise slipped from No. 4 on last year's list of the 10 hottest tech skills, make no mistake about its importance: Security professionals are in demand and can command high salaries. Exactly 50% of the IT professionals who participated in our Forecast 2016 survey said they plan to increase spending on security technologies in the next 12 months, and security was No. 2 among the most important IT projects that respondents have underway. Compensation for security pros keeps going up because demand for talented people is strong, and because security specialists play a critical role in most organizations. 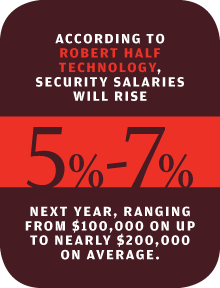 According to Robert Half Technology's 2016 Salary Guide, salaries in the security field will rise about 5% to 7% next year, ranging from $100,000 on up to nearly $200,000 on average. Andrew Ho is the new vice president of technology at Global Strategy Group (GSG). At the moment, he's both the top and only IT staffer at the public relations and research firm, which has 90 employees in four U.S. offices. He wants to add someone with experience in cloud computing and software as a service. Ho says GSG has made a significant investment in Salesforce tools, and he wants someone who can ensure that the firm is getting its money's worth from that technology and any cloud offerings it uses in the future. "We bought ourselves a Ferrari, but we haven't figured out how to get it out of first or second gear. There's so much more we can do with it," Ho says of Salesforce, noting that many companies face that challenge with other cloud-based systems as well. Others are following his lead, as the cloud continues to reshape enterprise IT. Research firm IDC predicts that more than half of enterprise IT infrastructure and software investments will be cloud-based by 2018. Specifically, spending on public cloud services will grow to more than $127 billion by 2018, according to an IDC forecast report. * 24% of respondents with hiring plans said they will be seeking people with this skill in the next 12 months. Web development continues to crack the Computerworld Forecast list of the top 10 most in-demand IT skills because organizations have come to rely heavily on the Web as a channel for connecting with customers, clients, partners and employees since they built their first websites a decade or two ago, IT leaders say. While they don't need Web developers to establish a Web presence anymore, they do need people with the ability to ensure that their sites are open and ready for business. "One of the main categories where we're seeing double-digit growth is in Web development," says Reed, of Robert Half Technology. "Companies want [to ensure] they have a website that's mobile-friendly, that's easy to navigate, and that showcases other products and services so it drives incremental sales." Responses from Computerworld's survey of 182 CIOs and senior technologists.